I’m not really a pancake girl; give me a plate of French toast instead anytime. But I have met my match in praline ricotta pancakes, which I can safely say are the best pancakes ever. My recipe is a riff off of the hazelnut-lemon-ricotta pancakes posted on The Wednesday Chef, from an Amanda Hesser article in the New York Times. Since I had leftover ricotta taunting me from the refrigerator, but no hazelnuts or whole lemons on hand, I improvised with almond praline, and the result was so delicious that we still haven’t gotten around to the original recipe, several batches later. Almond Praline: This is more of a guide than a recipe, as I am sure there are more authoritative ones out there. What I do is take a double-handful of slivered almonds, and begin toasting them over medium high heat until they begin to smell good. At that point I add a tablespoon of unsalted butter and around 3 tablespoons of granulated sugar, plus a sprinkle of cinnamon, and stir it all around until it begins to form a sticky syrup around the almonds. The moment it begins to look beige, I take it off the heat and pour it on a small plate covered with foil (if I am thinking ahead, I spritz the foil with canola oil first), and chuck it in the fridge while I make the pancake batter. By the time I am ready for the pulverized praline, it has hardened and is ready for the chop. I’ve done this successfully with walnuts also, and imagine pecans or hazelnuts would work admirably. 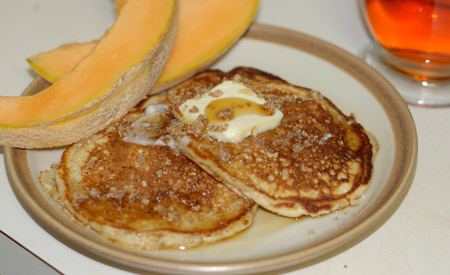 Pancakes: Mix the flour, sugar, baking powder, soda and salt. In another bowl, whisk the milk, butter, egg yolks, vanilla and ricotta. Fold this into the dry ingredients. Pulverize 1/2 C of the praline and stir it in. Break or chop several additional tablespoons of praline into small chunks for garnish. Whip the egg whites just until stiff, then fold them into the batter. Heat a pancake griddle, and lightly coat the surface with spray oil. Use a ¼ cup measure to scoop the batter onto the griddle. Cook until the pancakes appear dry around the edges, about 3 minutes, then flip them and cook for another minute or two. Serve with real maple syrup, garnished with chunks of praline. Serves 4. Update 2/5/07: Have made these pancakes lots of times, plain and with praline. They are definitely best with praline. Made a batch with almond praline this weekend for Jeremy’s birthday, and we had six leftover. These pancakes freeze well, though, so I wrapped them in wax paper and then foil, and they’re waiting for a lazy meal. Update 12/26/07: I made a batch of pancakes for my parents on Christmas morning and everyone really liked them. I think the sliced almonds make the best praline, at least for the part that you reserve for topping. these look amazing – i wish i’d had your inspiration when i had leftover praline to use up too!